Discussion in 'Indivisible' started by Meow-Professor, Oct 27, 2015. 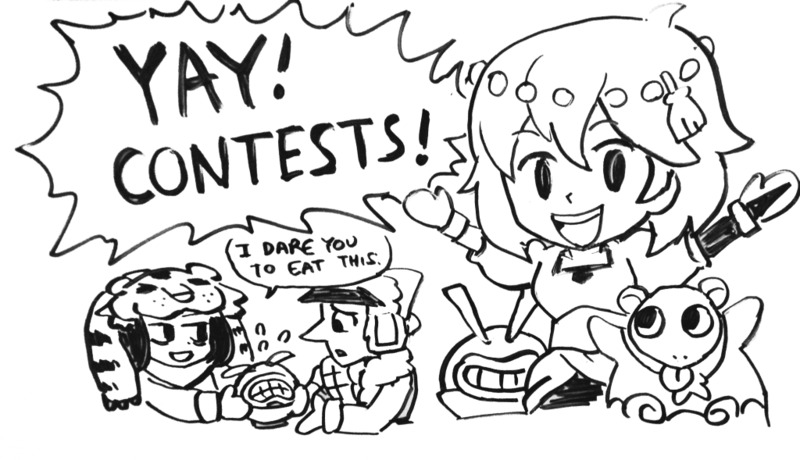 As most people know, Lab Zero is holding a contest to help get attention for the game. There will be 3 main contests: a fanart one, a cosplay one, and speedrunning ones. Here is the actual Lab Zero page about the contest. Basically the rewards are the items from certain tiers from the campaign. Talk about it here, I suppose. I'm personally planning to enter the fanart contest if I have time (...or paitence, mostly) to actually finish something. enmygrace, BallotBoxer, Nevins and 1 other person like this. Cool, thanks for the info, since I had no idea about the contest. The Indiegogo page or a Google search, etc.? They mention any character/monster, but I wonder if a background should be included. I guess I'd post it in DeviantArt, not sure about FB & don't have Twitter. Oh, heads up on the deadline: 11/10/15, but yeah, all the info's in the link. Oh the deadline is quickly approaching. Only eight more days! I have some traditional fan art (e.g. drawing/painting) in the works, but I wonder if creating an Indivisible-themed dish would qualify as fan art. Just like in the above whiteboard drawing, with Razmi offering a Hungry Ghost to Zebei, I want to see if I can make an edible Hungry Ghost. Already made an Italian variant: bowl of spaghetti in red sauce (chicken and zuchini mixed-in), an oval of bread for lips, and hunks of mozarella for teeth. And a salad version with crouton teeth and bell pepper lips. At KFC they almost have one with their "Famous Bowls." I find it repulsive, but imagine a bowl of mashed potatoes smothered in gravy with nuggets of fried chicken mixed in with corn. All are fine separate, but why glom them all together? The challenge lies in trying to make it look like a Hungry Ghost, but also be tasty and worthy of a meal (a bowl of plain rice is too easy!). SkullMan, KaboomKid, CaioLugon and 1 other person like this. You tagged me right! Yay! These winning entries were so good! Congrats to the winners! Some of these guys started on these back when it looked like the prizes weren't going to amount to anything, so it's great to see that their dedication has paid off! I'll admit, I was secretly pulling for the super-caterina art to win. Congratulations to the winners.